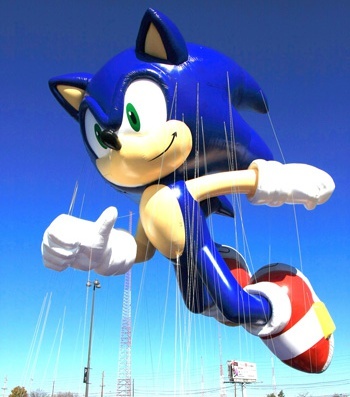 SEGA celebrates two decades of Sonic the Hedgehog with a new balloon for the Macy's Thanksgiving Day Parade. For all of you non-American readers out there, the Macy's Thanksgiving Day Parade is an annual event that not only celebrates Thanksgiving; but also, in theory, marks the beginning of the Christmas season. It sees hundreds of dancers, musicians and other celebrities make their way through the streets of New York, flanked by ornate floats and a fleet of giant balloon characters culled from the annals of pop culture. It's good wholesome fun and, despite the money involved, the event organizers don't take themselves too seriously. Sonic's modern incarnation, as seen in the recently released Sonic Generations, will be making an appearance at this year's parade. The picture to the right was taken during a test flight in New Jersey. This is the second version of the oddly-colored hedgehog to bless the parade with his inflated presence. In 1993, at the height of his fame, the classic version of Sonic was the first videogame character to be included in the parade. His glory was short lived, however, as midway through the event a heavy gust of wind caused the inflatable Sonic to career off-course before crashing into a lamppost and injuring an off-duty policeman. You'll be able to see the, hopefully properly secured, new Sonic balloon, alongside the newly introduced Julius the monkey and Aflac duck balloons, in action when the parade starts on Nov 24th.